Every goddamn day: 04/21/19: Back when Facebook was new, to me. Last month I sailed without comment past my 10th anniversary on Facebook — the system of course tells you. It's big on anniversaries, birthdays, anything to keep you using it, plugged in. There was something bittersweet about it, thinking of how much time I've dumped into that sinkhole. What could I have done instead? Learned to play the piano and well too, probably. That said, I have to admit, the latest data-mining scandal hasn't affected me much. I'm not sure I understand it, not sure how my "liking" Tom Waits' page somehow helped the Russians elect Trump. But Monday I found myself wondering what Facebook felt like when I first joined. I wandered back into the past, and found this, from a decade ago, when Facebook having 61 million members seemed a lot. It was back when my column filled a page, had subheads and was 30 percent longer than it is today. The original headline was, "Trying to save Face; Don't know if social network thing will work -- but can't be a Willy Loman." 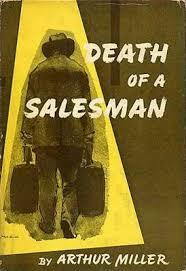 What new consumer product puzzles Willy Loman early in Arthur Miller's 1949 masterpiece, "Death of a Salesmen"? "Willy, dear," says Linda, his patient wife, trying to cheer him after an abandoned sales trip. "I got a new kind of American-type cheese today. It's whipped." Willy launches a tirade because he prefers Swiss. "I just thought you'd like a change," Linda implores. "I don't want a change!" he rails. "I want Swiss cheese!" Half a page of dialogue about other matters ensues before Willy pauses, out of the blue, to marvel: "How can they whip cheese?" "Salesman" has to be the most perfectly constructed play in the English language. The past and present mingle seamlessly, everything meshes together -- even the lilting flute music turns out to echo the hand-carved flutes Willy's lost father sold on the prairie. Reading it anew, to check my memory, I was struck by the great degree that technological change is part of Willy's gathering confusion and collapse -- the windshields of cars not opening as they used to, elms replaced by apartment blocks, fan belts in the new refrigerators and that wire recorder Howard, Willy's much younger boss, toys with as he fires Willy, playing meaningless bits of childish gibberish on the wonderful new machine while Willy desperately tries to talk to him, man-to-man. PAUL GENCIUS IS NOW MY FRIEND . . .
As you have gathered by now, the newspaper has sent its columnists, with an enthusiastic, "Everyone into the pool!" whoop, skittering into Facebook, the vast Web social interaction behemoth that is currently the bee's knees, as the kids once said. To be honest, I was dubious. "So we're supposed to take time away from writing for our 1.3 million readers in order to tell three or 30 or 300 people what we had for lunch?" I asked. The answer -- 60 million people are on Facebook! -- also had an obvious retort: maybe, but they're on 61 million different pages. But I try to guard against creeping Willy Loman befuddlement. "What do I do?" he despairs. Dismissing the new without trying it is a bad habit. Times surge forward, and if you don't keep up, the next thing you know you're babbling in the hall, moaning, "The woods are burning." So into Facebook we go. Easy as pie to set up a page. Post an old column photo. Trot out a few likes ("Master and Commander") join a few groups -- fans of Dante, of Mencken, of Thurber -- and then go out hunting for friends. Fun. Though I'm still puzzled as to how this drives people toward newspapers. If anything, it pulls them away. Reading is a leisure activity, and you only have so much time, and each minute you spend catching up on the doings of people in your network, giving them virtual pokes and backrubs, is a minute you can't be absorbing the news of the day. At the top of your profile, you post your status -- sleeping, working, whatever -- and keeping it current is a constant chore that reminds me of 10 years ago, when they introduced that Giga-Pet electronic toy and the editor-in-chief thought I should try one out. It was a little key-ring device, with a crude liquid crystal doggie — I called mine "Butch" —that pooped and slept and retrieved a stick. You had to play with it and you had to feed it, and if you didn't, your dog had a tendency to die. I would actually get up, out of bed, in the middle of the night, to feed the thing, lest I wake in the morning find to electronic carrion. Facebook has the same potential as a meaningless time sinkhole -- fun at first, and then a grim responsibility as you gather your growing brood of "friends" and try to stay informed of their doings while keeping them abreast of yours. Some have made their pages complex menus of items -- slide shows, Easter Eggs, posted gossip. You can tickle your friends, or encase them in a block of ice with your new superpowers. I found myself stroking Katy McDermott's cat -- electronically, of course -- via "Catbook" where you can create a Web world for your pets in case your own electronic world and, oh yeah, the real world, aren't quite demanding enough. I'd write Facebook off as a trend -- this year's Giga-Pet writ large. But I wrote a column in 1983 that dismissed cell phones as an inexplicable fad, and after that I try not to predict the future. Let me tell you what the entire Facebook experience left me thinking: I should call Kier. He was my college roommate. This fall it'll be 30 years since we met. He lives with his family in Naperville, and while we all get together, from time to time, it's been a few months and a phone call is long overdue. He keeps up with me through this column, but I don't have a similar way to keep up with him, since Kier's too busy actually living his life to dangle an electronic marionette of himself on Facebook. Kids might like trolling the electronic sea for companionship, but my guess is most adults can hardly give their old friends the time and attention they deserve, never mind start culling hordes of new ersatz friends out of the online millions. Facebook doesn't mirror life. Co-workers who shun me in person -- who blow by, averting their eyes lest they be drawn into conversation -- have pledged their palhood on Facebook. It's all very curious, but then perhaps I'm treating it more seriously than it's meant to be treated. "Though I'm still puzzled as to how this drives people toward newspapers. If anything, it pulls them away. Reading is a leisure activity, and you only have so much time, and each minute you spend catching up on the doings of people in your network, giving them virtual pokes and backrubs, is a minute you can't be absorbing the news of the day." Hit the nail on the head there. As well as a minute that you're not reading a magazine or a book. I'm not one to ridicule other people's hobbies or interests, but whatever satisfaction folks derive from Facebook, I don't believe one can deny that it has contributed to the precipitous decline of newspapers. Fighting "against creeping Willy Loman befuddlement" is a noble fight. Not that there's anything to be done about it, but I don't think one needs to be as befuddled as Willy to wish that he or she could trade all the Facebook and Twitter followers in his/her orbit for the 1.3 million Sun-Times readers mentioned in this column, alas. Funny how they push you toward Facebook given its recent troubles. Did Kier ever join Facebook? I wonder how many people have heard of the "Fuller Brush Man." I don't remember what Willie Loman was selling. I have never seen the play, but read it a couple times long ago. They never say what he's selling. That's one of the many twists of genius in it. I saw it many years ago in Milwaukee of all places. A good road company cast led by Thomas Mitchell replacing Lee J. Cob. That was a long time ago -- Mitchell died in 1962. I looked him up because I was 100% certain he played the main character in The Informer and I was 100% wrong as usual. We saw the 1998 Robert Falls / Goodman Theater production, starring Brian Dennehy, that later moved on to Broadway and won Tonys for Best Revival of a Play, Falls and Dennehy. One of the things I remember about it is, alas, that Kevin Anderson, who was nominated for a Tony and won a Drama Desk Award for his role as Biff, was absent that night because of some kind of engagement in New York. One always hates to see that there's a little slip of paper in the program announcing a substitution, but that one was particularly bitter! D'oh! Read the play for high school English class, and was still too young to be impressed or moved. Twenty years later, when I saw the superb PBS production that featured Dustin Hoffman, I was blown away. Now another thirty-plus years have whizzed by, and all that "gathering confusion" and "creeping befuddlement" have become a good part of my daily existence. Music, technology, methods of communication, popular culture, all have become a part of trying to "keep up", which I've finally given up trying to do. Texting? Tweeting? Instagram? What the flood? Suddenly e-mails and telephones are outdated, VCR tapes are ancient history, and where the hell have all the pay phones gone? As for Farcebook, when it exploded from entitled preppies rating potential dates and mates into a must-have essential for the teeming millions, and then billions, I balked at getting on the train. Unlike my old man was, an early adapter I am not. Privacy issues surfaced immediately, at last for me, anyway. Sinkhole, indeed. It seemed like too much effort to have to do all that keeping up, and an enormous waste of time. All that frivolousness: what I ate today, what my friends were doing. Would I even HAVE any friends? I pictured myself with ZERO friends...the ultimate failure, "out there" for all the world to snicker and snark at. Likes. Dislikes. Status. What am I DOING right NOW...sounded almost like revisiting high school. Being "friended" by strangers who wanted something from me...perfect opportunities for hackers and scammers. So I never got on board. My wife opened an account in order to comment on a political site, but she has never posted a single keystroke, not even her picture. Neither of us feel any great loss or void, or that we have missed the bus. We're geezers who've already missed enough Real Life buses, both literally and figuratively. Cigarettes are not good for you, and the best thing to do about them is to never start smoking them at all. I wasn't smart enough to heed that warning, and indulged in that nasty habit for 32 years. But Facebook was another story. And when the data-stealing scandal has been exposed, I felt more vindicated than ever. All those millions of lemmings and sheep who were foolish enough to spill their guts on social media for all those years, and who scattered their personal data to the four winds, are now reaping the whirlwind. Regrets? Hell yeah, this late in life I have plenty. But staying out of the Facebook Army is certainly not among them. Joined Facebook so my sister could see our cousins' new boyfriend. Found out too much about my other cousins and their love of Trump. I rarely visit the site now but am glad that I never completed the profile. If you don't already know me, you would learn little from my Facebook activity. Besides, I don't have time for FB, I am too busy reading. I joined Facebook in 2009, decided it wasn't for me, and cancelled it. At least I thought I did. A few months ago I decided to give it another chance and all my information was still there. Maybe Cambridge Analytica saved it for me. Such nice people. Anyway, this time around, Facebook has been a bittersweet experience for me. More bitter than sweet. For every one pleasant experience there are three or four annoying distractions. Way too much information! I've already "snoozed" ten of my "friends" and "unfriended" one. It's been nice reconnecting with a few old friends, but other than that, it doesn't hold much interest for me. Hell, it took me a week to get around to reading this column.